Many typical parishes were centred on their church. This was usually surrounded by a cluster of homes inhabited by tradesmen and labourers. Further out from this hub were the farms and the scattered cottages of farm workers. I have adopted this model to define Preston. Included, therefore, are the people living within the central ‘figure of eight’ formed by Church, Chequers, Butchers, School and Back Lanes and Crunnells Green. Then there are the cottages on the outskirts of the village: Kiln Cottage, Hitchwood, Poynders End, Hill End, Sootfield Green and Wain Wood. These are the families that I have included in Preston for the censuses. Some might argue that Hill End should be grouped with Langley and not Preston. 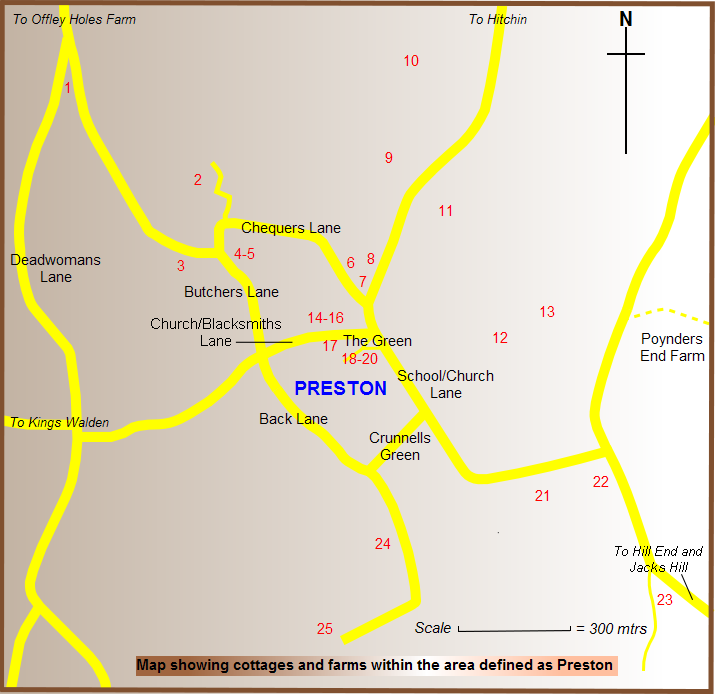 However, there is an equal distance between Hill End and Preston or Langley. In some parish records, Hill End is described as ‘Preston’. For example, when Annie Rose Shambrook, the daughter of farmer James and his wife Rose, was baptised on 26 June 1863, their place of residence was described as Hill End, Preston. Also, children from Hill End attended Preston School. In the 1890’s the Preston School register shows Emily and Charles Thrussell, Ernest Busby and Mary Wright as residing at Hill End.